Hazrat Zainab (pbuh) the daughter of Imam Ali (pbuh) and Hazrat Fatimah Zahra (pbuh) and the granddaughter of Prophet of Islam, Hazrat Muhammad Mustafa (pbuh), reflected in her character the best attributes of those who brought her up. In sobriety and serenity she was likened to her grandmother Hazrat Khadijatul Kubra (pbuh); in chastity and modesty to her mother Hazrat Fatimah Zahra (pbuh) – the Mistress of the Ladies of the Worlds; in eloquence to her father Imam Ali (pbuh); in forbearance and patience, and in bravery and tranquility of the heart to her brothers Imam Hassan (pbuh) and Imam Hussein (pbuh) – the Masters of the Youth of Paradise, respectively. Her face reflected her father’s awe and her grandfather Prophet of Islam, Hazrat Muhammad Mustafa’s (pbuh) reverence. She was born in Madina, om 5 Jumada al awwal, 5 AH (October 2) 626 CE Julian calendar. Just like Hassan (RA) and Hussain (RA), she was also named by Holy Prophet Muhammad (PBUH). 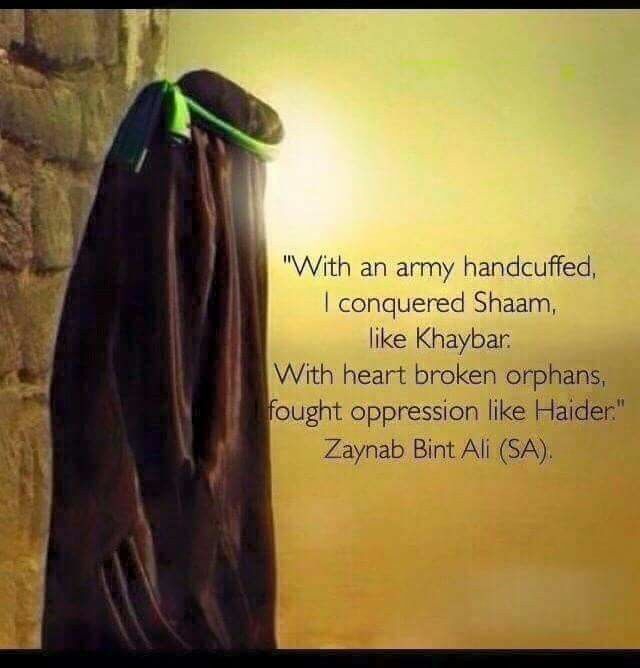 Ali (RA)’s three daughters were named “Zainab” so, she was called as “Zainab the Elder”. By the time her (RA) mother (RA) died, she was just 7 years old. As per a biography, The Victory of Truth, She (RA) used to teach Quran to the women. and continued teaching even after moving to Kufa. She was married to Abdullah ibn Ja’far (RA), who was the nephew of Ali (RA). She and her husband spent a modest life. Zainab (RA) had five children, four sons Ali (RA), Aun (RA), Muhammad (RA), and Abbas (RA) and a daughter Umm Kulthum (RA). On the 11th Muharram, 61 AH, after the battle of Karbala, the caravan of the captives were marched through the city of Kufa and Shaam. For one year they stayed captives in Damascus prison. 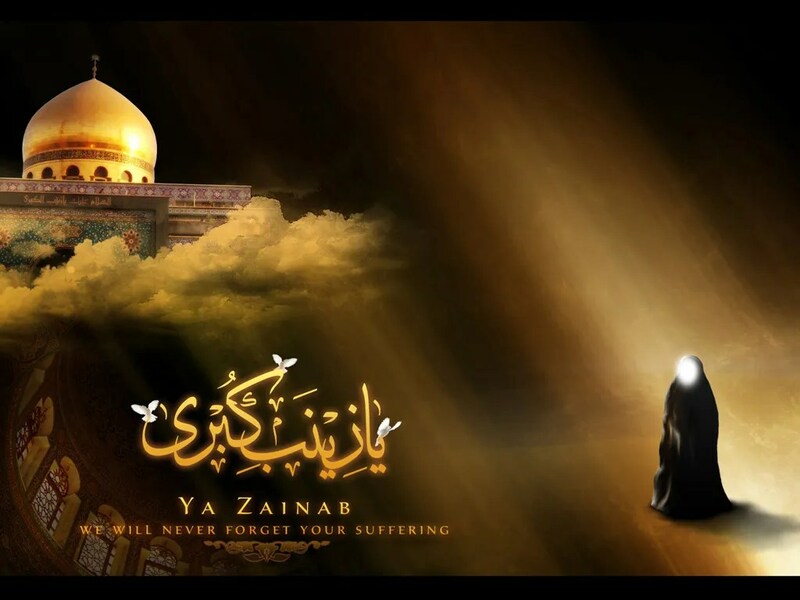 Bibi Zainab (sa) faced Yazid after the Tragedy of Karbala very bravely and told him of the wrongs he had done. She also gave very good lectures whenever she got a chance; she therefore enabled the people to know the principles and practices of Islam and the wrong and merciless killings of the followers of Imam Hussein (pbuh) in the battle of Karbala by Yazid and his cruel army. Due to her honesty, bravery and truthfulness, Islam spread through Shaam. 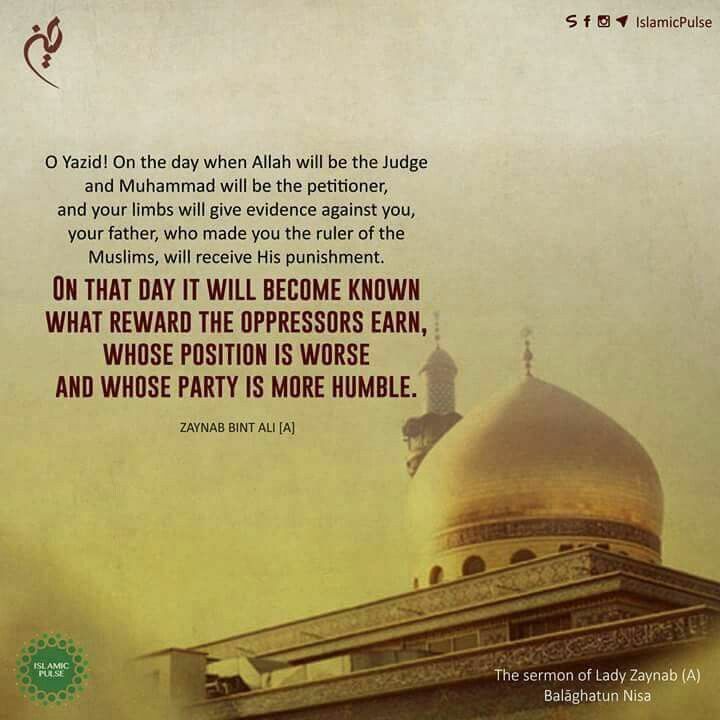 Then they were released from prison, Bibi Zainab (sa), along with the rest of the members of Ahlul Bayt (as) went to Medinah. Even in Medinah, she continued preaching. Islam spread rapidly. 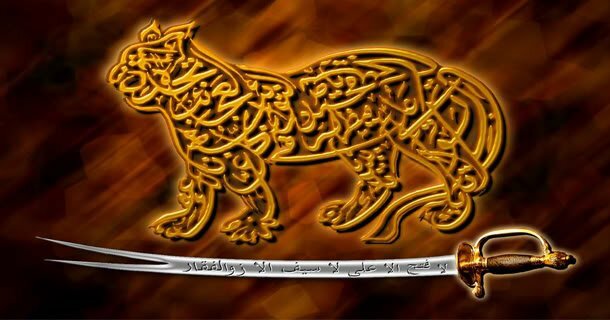 The governor of Medinah became very frightened and wrote to Yazid that Bibi Zainab (sa) was in Medinah and was spreading Islam quickly and that she would break his empire. 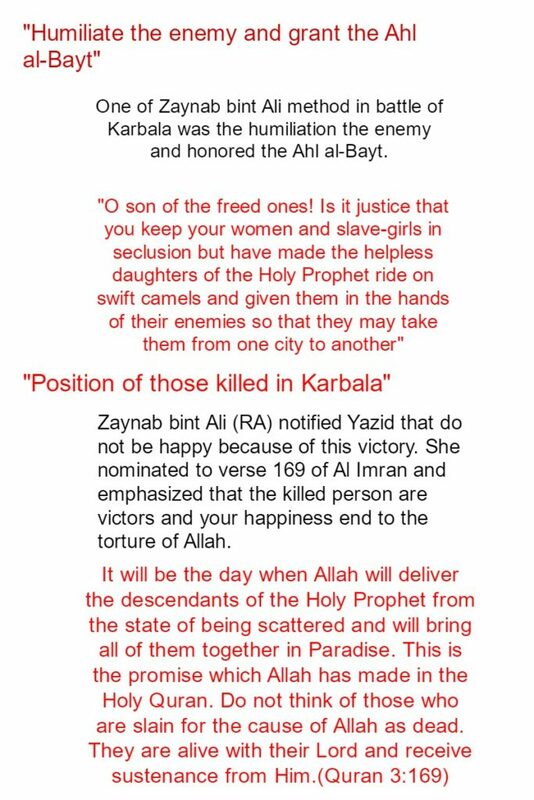 Yazid gave orders that Bibi Zainab (sa) should leave Medinah and settle in a village outside Medinah. Later on from there she was sent to a town called Misar, which is in Egypt. She continued spreading Islam there as well. Yazid became very scared so he once again ordered that she be taken prisoner and brought to Shaam. When she arrived at a small village on the boundary of Shaam, she remembered where Imam Hussein (pbuh) head had been kept on a farm under a tree. When she found the tree, she started crying. A man of Shaam, who was a follower and friend of Yazid, saw her and hit her with a spade on her head. She collapsed and died. 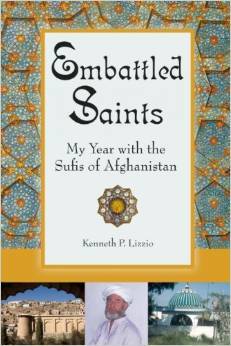 That is how this small town came to be known as As-Syed Zainab. According to historians, Bibi Zainab’s husband – Abdullah Ibne Jafar-e-Tayyar bought the surrounding land and made the Rauza/Ziyarat especially in the name of Bibi Zainab (sa). 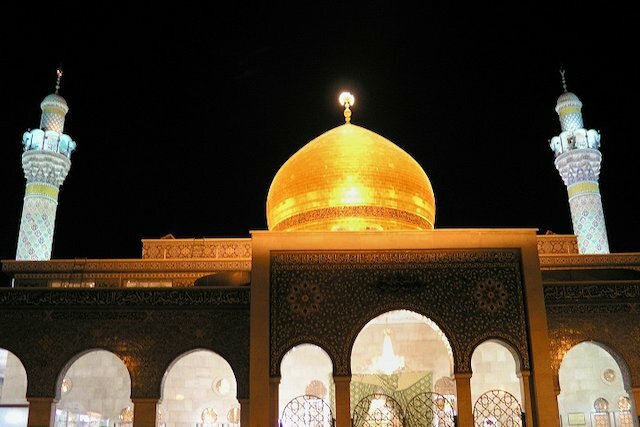 Hazrat Zainab’s shrine in the town of ‘Sit Zainab’, Damascus, the capital city of Syria (Shaam), has granted her name to the town awarding it more beauty, spirituality and fame. The holy tomb of Hazrat Zainab (pbuh), is a haven and refuge for the disheartened ones from around the world. The shrine with regard to its elegance, magnificence, splendor, grace, nicety, decoration and beauty is the most beautiful and marvelous not in Damascus, Syria (Shaam) alone but in the Arab and Islamic world. Note: In Cairo, Egypt there is another Rauza/Ziyarat dedicated to Bibi Zainab (sa) and the place is known as Masjid-e-Zainabia. This Bibi Zainab is the daughter of Yahya, Yahya bin Hassan, Hassan bin Zayed, Zayed bin Hassan, Imam Hassan bin Imam Ali bin Abu Talib (pbut). 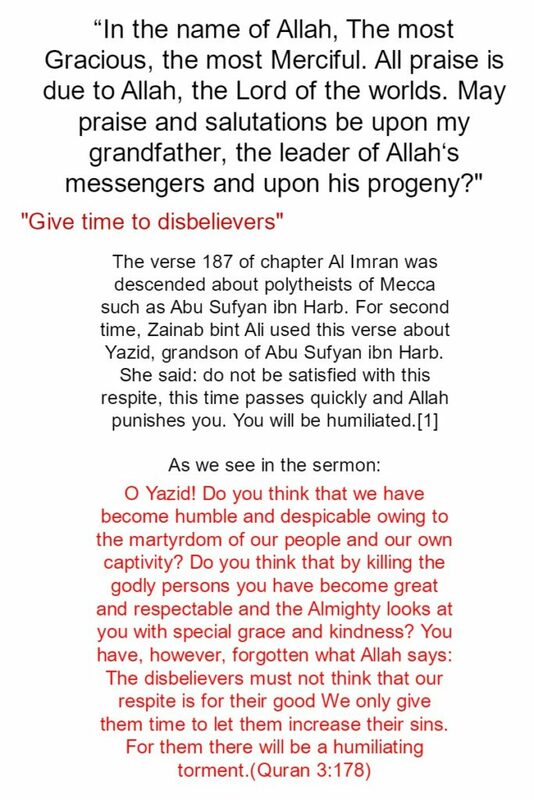 After they have been presented in the court of Yazid, Zainab (RA) said a Khutba (Sermon), which still Muslims all around the world and get inspired by the references and words she used to counter Yazid’s misbehavior.